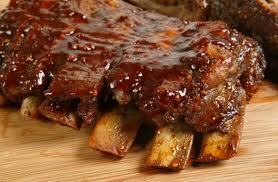 These ribs are fall off the bone finger licking good!!! I put them in the oven, I like this method for me because is less hassle, I prep them the night before, then the day of I can put them in the oven and forget it about for a few hours. Mix all spices together in a bowl, set aside. Flip ribs over to the back, there is a thin piece of skin that needs to be removed, at one end of the ribs with a knife start at an edge to peel up a little of the skin. With a paper towel grasp the skin and pull gently as the skin comes up, using the paper towel helps it from slipping out of your grasp. Rub a the entire rack with all the rub on both sides, put into a jumbo zip-loc bag, or you can cut ribs in half and use a gallon size bag. Place in refrigerator over night. Take ribs out of the refrigerator about 1 hour before cooking. Using heavy-duty alumium foil, lay one sheet out 8 inches longer then the rack of ribs. spray sheet with non stick cooking spray and place ribs face up, take another sheet same length and spray one side as well, putting that side down on top of ribs. Fold both edges of the foil together rolling the edges towards the ribs, stopping about 1 inch before the ribs. Place the package on a baking sheet and bake for 3 hours, after 3 hours take out of the oven, increase heat to 400 degrees. Remove the top piece of foil and add your favorite BBQ sauce to the top of the ribs all over, then place back in over without foil for 15 minutes. I love serving roasted vegetables with the ribs, like pieces of corn on the cob, red potatoes etc. I put those in the oven 30 minutes before the ribs are done.